Sunday morning we were up bright and early to go to the Zoo Zoom. I knew it was going to be hard having two days worth of stuff back to back and it was. Sacramento is over an hour away. I had signed Trevor up to run the one mile and it took a lot of coaxing to get him up and ready to go. We got there with enough time to hit the porta potties and to hang out for a bit. Scott and I were both running the 5k and Trevor wasn't running until later. My sister in law and her dad were also running but we couldn't find them. I had to give Trevor some strict instructions on where to go and to "look for Uncle Joe" along the finish line. Sporting my new "Lion" pants that I got on my birthday. They started off as a joke. I saw them at Target and took a picture to show my friend Kristin who thinks my Tiger pants are the ugliest thing on earth haha. I posted it on Facebook and next thing I know I've got Lion pants on my birthday. I remember when I ran this last year (I did the 10k then) I didn't really like the course because of the way it loops around. I like it better when I have more of a mental picture of where I'm at and going. I felt the same this year too even though I was only making one loop on the 5k. 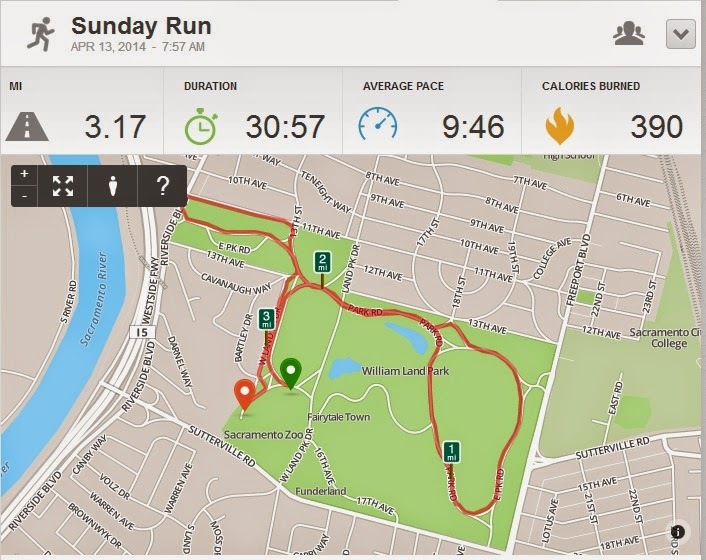 I had not ran in 3 weeks since my half marathon (how crazy is that?) so i didn't really expect to do all that great. I came in at 30:30 for my actual chip time. Which wasn't bad for not running for 3 weeks but kind of sad that I didn't get it in under 30! Oh well! I can only do so much and the days are definitely not long enough all ready. When I was coming through the finish shoot I thought I heard my brother Joe. Trevor was sitting over on the side lines by himself. They were probably only about 100 yards from each other but had not seen each other. Scott came in not too long after me. And then my sister in law Megs and her dad Charly. After we got done we had about 2 hours to kill before it was time for the kids fun run. They really should do the kids first to get them done and out of the way. We went and got some thing to eat from the snack tent and then walked around for a little bit. I'm so glad we got Trevor to go because him and my niece Adrian had fun hanging out together. They had all the kids races as the same starting time but they actually had them start about 15 minutes apart from the youngest runners (Adrian) to Trevor's one miler. They were so cute all lined up waiting for the chicken to run so they could chase it. Trevor was so into watching Adrian he ended up running along the side of her. It was so cute! She was so happy with her medal. 15 minutes later it was time to run the mile. Trevor said that they don't run the mile in school. Weird I thought all kids did that. We didn't do any training runs or anything so I was hoping he was going to be ok. He didn't want me to run with him even though I offered. The poor chicken did the 220, 440, 1/2 mile AND the mile. The kids started coming in and I was watching to see how he was doing. Eventually I saw him coming, but wait? Is that Charly with him? It was! Charly had got behind the kids and ran with Trevor. So sweet! I walked towards them a bit and Trevor said he got 3 cramps! He was walking a bit but when he realized how close he was to the finish he started running again. He got done around 13 minutes which was not bad at all for not really running! I may have got a bit teary eyed watching him run in. He was tired but pretty happy he did it. After his race my brother and everyone else left and we went back into the zoo and finished seeing it all. It's a tiny little zoo but fun for a little day trip. I totally fell asleep on the way home. I woke up when we stopped to eat and then fell back asleep after we got back in the car. When we got home I laid down on my bed and slept until the sun got too hot in there and then laid around on the couch for the rest of the day. I ABSOLUTELY love the lion pants - soooo cute! I am off to See if they still have some at my store!!!! On Memorial Day my niece will run her first mile race ever- also no training and she is sooo excited! I hope she has a smile as big as your sons when it's over!!! !